Skwawkbox Goes “undercover” in Venezuela and finds a Horn of Plenty in Supermarkets. Venezuela, March 2017, Queue for 2 Bags of Goods. For her Empire Files series, journalist Abby Martin filmed undercover in a series of Venezuelan supermarkets – and found something very different to what those watching BBC and other mainstream news would expect. Skwawky reminds me of a certain Édouard Herriot (1872 – 1957) Parti Radical, and many times French PM) who remarked during a visit to Stalin’s Russia in 1933 that, the “Soviet Ukraine was “like a garden in full bloom”. This is what Wikipedia has to say, Shortages in Venezuela. Under the economic policy of the Nicolás Maduro government, greater shortages occurred due to the Venezuelan government’s policy of withholding United States dollars from importers with price controls. Shortages are occurring in regulated products, such as milk, meat, coffee, rice, oil, precooked flour, butter prices and other basic necessities like toilet paper, personal hygiene products and medicines. 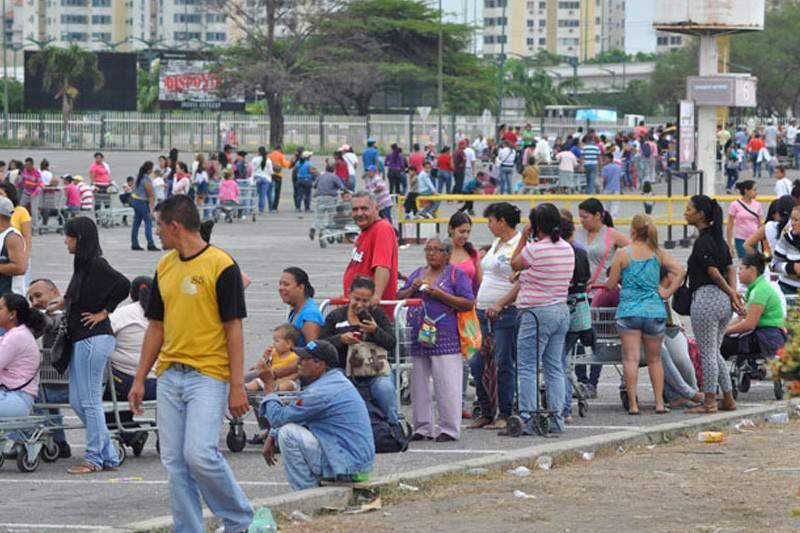 As a result of the shortages, Venezuelans must search for food, occasionally resorting to eating wild fruit or garbage, wait in lines for hours and sometimes settle without having certain products. OVER 100,000 Venezuelans queued at the San Antonio del Tachira border crossing into Colombia over the weekend to buy foods and medicines that are in short supply at home. It was the second weekend in a row that the socialist government has opened the border with Colombia, which was closed, as were all crossings, a year ago to obstruct smuggling. Speculators were accused then of causing shortages by buying state-subsidised food and petrol in Venezuela and taking them to Colombia to be sold for far higher prices. Venezuelan President Nicolas Maduro has played down talk of a humanitarian crisis, blaming his government’s political enemies and self-serving smugglers for shortages. He dismissed as a “media show” televised images of 500 women pushing through the border checkpoint a few weeks ago claiming to be desperate to buy food. Venezuelan state TV ran footage on Sunday of citizens returning from Colombia empty-handed, dissuaded by “price-gouging” and the threat of violence from their neighbours. So Skwawkbox have been caught out spinning faubations yet again. Any shortages are the fault of the ‘monopoly capitalists” and….well there are no “real” problems with food in supermarkets as a single video shows. Perhaps one could ask who, with hyper-inflation, can afford to but anything. Full marks for ‘undercover’ investigation into a Venezuelan supermarket though. Tagged with anti-imperialism, Skwawkbox, Venezuela. Background to this fake news report, on Abby Martin. “In 2008, Martin posted a video showing her support for the 9/11 Truth movement. She has labelled the US government’s version of September 11, 2001 as “propaganda”. During the administration of President George W. Bush she said of the attacks: “I’ve researched it for three years and every single thing that I uncover solidifies my belief that it was an inside job and that our government was complicit in what happened.” The New York Times described her as a 9/11 conspiracy theorist, but Martin told the Associated Press in March 2014 that she “no longer subscribes” to the theory that 9/11 was an inside job as she did earlier. I think the Abby Martin video has to be dealt with. Either she visited a normal average Venezuelan supermarket or the whole thing is a hoax. We weren’t told where the supermarket was or why she had to film “undercover”. Is the implication that the government of Maduro would have prevented her showing what he claims is reality? Is it possible to ask here these questions and who is behind skwarwarkbox? You would need to speak Spanish but the sub titles translations are accurate. I think her take on the press is different as the opposition papers are strapped for cash and can’t get the newsprint or the distribution networks. “Si la crisis venezolana no es atajada, el tsunami puede afectar gravemente también a otros países de la región. El país es un polvorín de desgobierno, con múltiples focos de violencia aun dentro de la FANB, y armado hasta los dientes. Más de 15 millones de armas ligeras se calcula que circulan entre una población de 31 millones, y sobrecoge pensar que el armamento militar de origen ruso en el que Chávez invirtió millardos de dólares, incluidos misiles superficie-aire portátiles, pueda nutrir alguna red de contrabando de las muchas alentadas por el Gobierno. Tendance Coatesy needs your support. This blog is provided free of charge but depends on the generosity of its readers to be viable. If you can afford to, please click here to arrange a one-off or modest monthly donation via PayPal. Thanks for your solidarity so this blog can keep bringing you information the Establishment would prefer you not to know about. Is this the same Abby Martin who was unceremoniously sacked from Russia Today (RT) after her on-air outburst when she said she could not longer go along with the channel’s unwavering support of the Kremlin, among other issues, the situation in the Ukraine? You could pull the same stunt in virtually any country depending on the picture you wanted to paint: In the UK you could film choose between an upmarket Waitrose/Marks and Sparks or a foodbank to film in. Same county – two entirely different perspectives on the same story. I have a lot of time for HUman Rights Watch reports. I have little time for reports from teleSUR on Venezuela.